Happy Easter!!! On this Easter morning we gather to celebrate not only the resurrection, but the great lengths God is willing to go in order that we, the lost, might be redeemed. Over the past three days we have devoutly recalled how Jesus was willing to bear being tortured and mocked, how he died on the cross, and how he descended into hell and then unlocked the gates of heaven, thereby conquering the darkness of evil and sin. From the hopelessness of the tomb, Christ has risen, and he comes to us today with the promise of eternal life!! 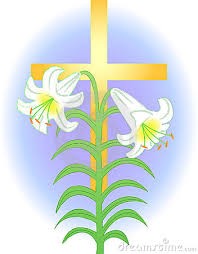 Our entire Parish Staff join in extending to you our best wishes for a joyous Easter. We say “Thank You” to all who made donations towards the beautiful decorations for our church this Easter. Also thanks to all those involved in our liturgies on Holy Thursday, Good Friday, and the Easter Vigil on Saturday. We also extend a warm welcome to those who are visitors to our Parish – we’re happy you chose to celebrate Easter with us!! We extend an invitation to you to become a regular part of Mary, Queen of Heaven. Please visit our parish website and give me a call if you have any questions. Welcome, again, and have a blessed Easter!! A big “Thank You” to everyone who has donated to the DPAA – I greatly appreciate it. If you haven’t contributed yet, please do so soon. Envelopes are on the tables in the Narthex – or just call the parish office (525-6909) and we’ll get you one. I’ll be away from the parish the week after Easter, from April 16 thru April 23 – I leave you in the hands of the best assistant pastor in the diocese – Fr. Niby. As I write this on Monday, April 10 – the Reds are in first place!!! Needless to say, I’m in heaven and enjoying it while it lasts!! Go REDS!! !